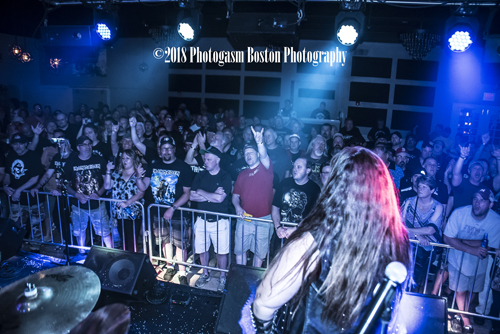 KNAC.COM - Reviews - THE IRON MAIDENS In New Bedford, MA With Photos! 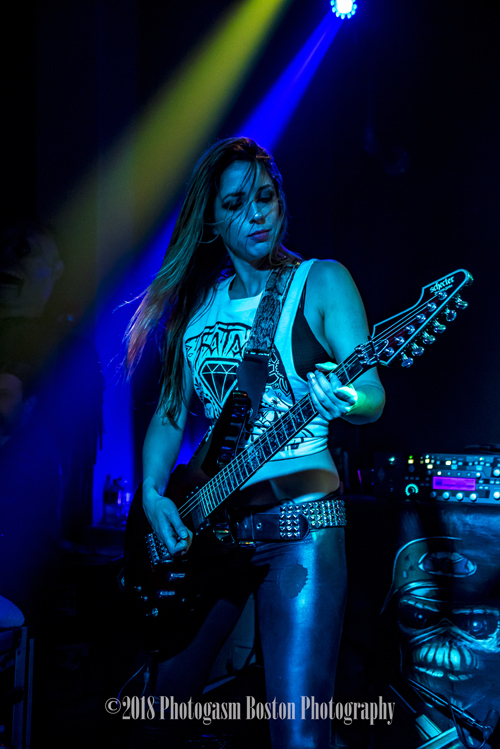 THE IRON MAIDENS In New Bedford, MA With Photos! 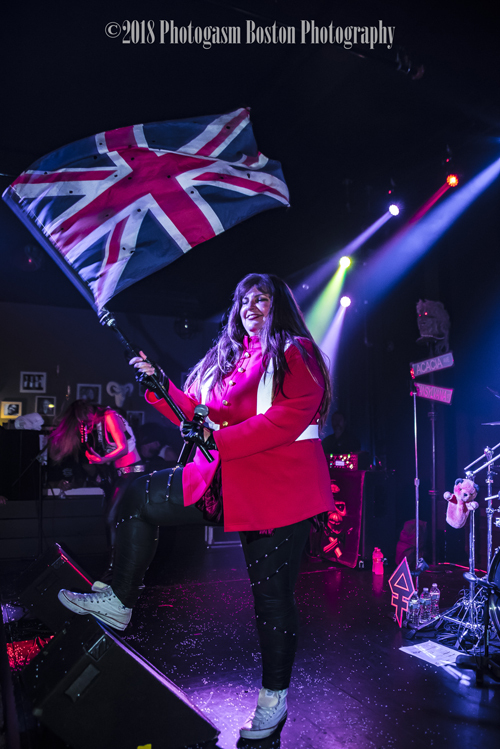 After experiencing a less than thrilling VAN HALEN tribute band performance at the same venue a few weeks back, I wasn't necessarily sure what to expect as I prepared to see The THE IRON MAIDENS at their sold out Saturday June 30th stop in New Bedford, MA. I was soon to find myself immersed in not one but two highly energetic and entertaining shows as the bill paid tribute not only to IRON MAIDEN but to ALICE COOPER as well. 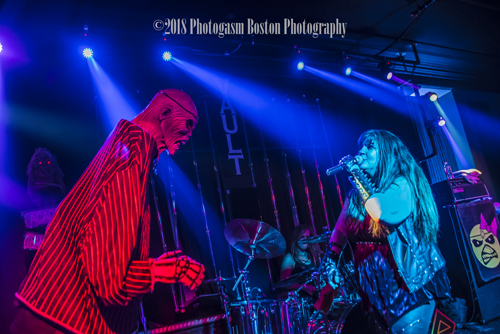 Billed as the Ultimate Alice Cooper Experience, EAST COAST ALICE opened the show and you were immediately captivated by the band's spot on tribute to the master of shock rock himself, Alice Cooper! And it wasn't simply a musical performance of the songs either. This was a set that fully echoed the actual Cooper stage show. There were stage actors aplenty weaving in and out of the band's performance. You really did feel like you were at an Alice Cooper show. Musically, the band was spot on and they sounded great. It was a highly energetic and captivating performance. Of course, everything comes together based on the performance of "Alice" himself and on that front, I have to say that singer Mike Carmo was FANTASTIC. He had the look, the mannerisms and most importantly, the commanding voice and stage presence. As the focal point of the entire show, he owned the crowd from the start. The only slight nitpick I had with the show had nothing to do with the music at all. It was when during a vocal break I saw Carmo drinking from what looked like a beer bottle on stage. Given the actual Alice Cooper not being a drinker anymore, this took me out of the show that I'd so willingly bought into, at least for the immediate few moments after I saw it. As the show rocked through one Cooper classic after another, there were some audio glitches with the venues sound system but the band powered through those hiccups with aplomb. The entire show was highly theatrical (which I know is how it should be, but still it is worth mentioning) and EAST COAST ALICE more than lives up to that "ultimate" billing! CONCERT FUN FACT #1 - Bob Mendell, the vocalist for Taunton, MA based band ON YOUR DEATHBED served as the stage emcee for the show. When he wasn't on stage making announcements, I hung out with him and his wife during the EAST COAST ALICE set. After what seemed an excessively long delay between sets (which I believe was down to some technical issues), UFO's "Doctor Doctor" started playing and it was soon time for me to at long last witness that which I've heard and read about for years...The World's only female tribute to IRON MAIDEN! THE IRON MAIDENS have been paying tribute to IRON MAIDEN since 2001 and despite a series of lineup changes, they've really got this act down pat. 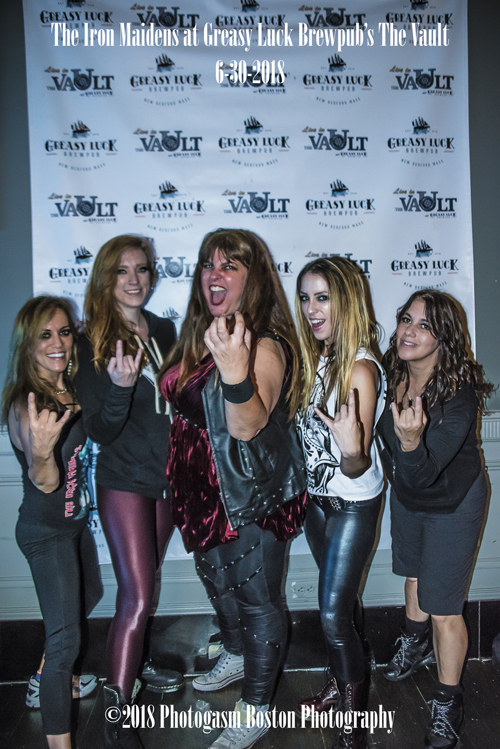 The lineup these days is: Vocalist Kirsten "Bruce Chickinson" Rosenberg, bassist Wanda "Steph Harris" Ortiz, guitarists Courtney "Adriana Smith" Cox and Nikki "Davina Murray" Stringfield and drummer Linda "Nikki McBurrain" McDonald. Exploding out with the opening "Wicker Man", it was all about celebrating the "Legacy of the Beast" and celebrate is exactly what the band and crowd did! While the band seemed plagued by the same sound issues that affected parts of the EAST COAST ALICE set, it was soon put aside to focus on the music. Not to mention the on stage appearances of Eddie and Satan himself! The crowd sure enjoyed what they were hearing as I could see many of them singing along in an overly enthusiastic way. I had three guys in front of me who seemed to lose their minds over each song. Later in the show, someone bought shots for the band and one of the stage hands brought them onstage during a break in the set. This led to a moment that I found amusing when Courtney Cox refused the shot and I could see her say, "I don't drink", and the stage hand (Wences Lauts, who saw me earlier in the evening and commented about my KNAC.COM shirt) downed the shot in her stead. The set list contained well known IRON MAIDEN classic tracks that HAD to be included (can you imagine not hearing "The Number of the Beast"?) but what I liked is how they also worked in a few songs that you don't hear all the time during actual MAIDEN shows. The entire band sounded great (audio glitches aside) and I really enjoyed the vocal work from Rosenberg, especially when they performed one of my all-time favorite tracks "Alexander The Great", which I'm pretty sure I've never seen IRON MAIDEN perform live the three times I've seen them. That was the song that really got me to sing along on this night because it is such a fantastically crafted track. I found my attentions bouncing back and forth between each band member's performance throughout the set. It was fun to watch them not only perform but interact with the crowd and each other. I'm sure there are lots of IRON MAIDEN tribute bands out there, but after witnessing THE IRON MAIDENS, I'm not sure I want to see any of the other ones. I just really got into their show a whole lot. This was both unexpected and surprising to me for some reason, despite having an affinity for them from afar anyway. This was a great show for THE IRON MAIDENS overall, the music sounded great and the crowd couldn't have been more enthusiastic without seeming as if they needed to be put in a facility. The band is certainly deserving of an "Up The Irons!" shout out because they did bring the house down with a fiery and intense show that reminded everyone of just how great the music of IRON MAIDEN truly is. CONCERT FUN FACT #2: I've been a huge fan of Linda McDonald ever since the 1989 debut album from PHANTOM BLUE. So part of the reason I wanted to go to this show was so that I could hopefuly get the chance to meet her. After the show, they did a meet and greet where they all signed the band photo. But I also had the chance to get my copy of the PHANTOM BLUE album Built To Perform signed by McDonald. While she was having trouble speaking due to losing her voice, she was genuinely enthused to see the CD booklet for the album for her to sign. So that's another item crossed off my musical bucket list!